The National Organization for (Heterosexual) Marriage’s Rhode Island affiliate today resorted to put-downs against the state’s new, Independent governor Lincoln Chafee. Way to go to win allies, folks! Christopher Plante, the head of the affiliate, reportedly called Chafee an “accidental governor” for winning with 36 percent of the vote in a seven-way election. 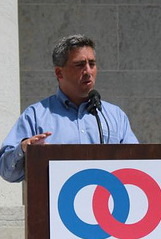 Chafee’s opposition was headlined by Democrat Frank Caprio, the early presumptive winner who first alienated his progressive base by refusing to support marriage equality and then lost the support of the Democratic establishment by telling President Obama to “shove it” after Obama declined to pick sides and endorse either Caprio or Chafee. The GOP challenger, John Robitaille, was supported by just 20 percent of voters until Caprio’s campaign collapsed; he finished in second place with 34 percent of the vote. The state’s churches will enjoy more of Plante’s thoughtful insights this Thursday, when he and the Family Research Council are hosting a three-hour summit for New England antigay pastors seeking to block marriage equality in the Ocean State.